I am often asked about the difference between decision support systems and decision management systems for decision automation. All decisions involve a choice, a selection of a course of action from a set of alternatives and generally result in an action being taken, not just knowledge being added to what’s known. Decision Management Systems, unlike Decision Support Systems, are focused on decision automation, taking or recommending this action. Decision Support Systems are focused on helping (supporting) someone make the decision, not necessarily on the actions to be taken. While both Decision Support Systems and Decision Management Systems apply expertise and judgment, Decision Support Systems rely on the user to have experience and apply their own judgment. This means that decision support systems align well for strategic and management/control decisions where the user is likely to have some significant experience. A decision management system is well suited for operational decisions, where even small improvements in performance of high volume individual transactions add up to significant value quickly. In a Decision Support System the user is generally responsible for reading, understanding and applying the policies and regulations relevant to the decision. In contrast a Decision Management System uses business rules or other decision logic management capabilities to embed the relevant policies and regulations and so ensure the system is compliant with them. When compliance is critical, then a Decision Management System is going to be a better solution. In a Decision Support System information is presented to a user so they can analyze it. Increasingly this means using advanced visualization and other approaches to both summarize more data and make it more obvious what patterns are in the data. In contrast a Decision Management System doesn’t rely on visuals but instead applies analytics programmatically. What this means is that while a Decision Support System might help a user see the likely futures implicit in their data and so act appropriately, a Decision Management System will apply data mining and predictive analytic insights automatically and every time, improving business performance. Of course many scenarios involve a blended approach, with a Decision Management System rapidly determining a small set of possible actions, taking the best if this is clear and presenting the set of actions in the context of a Decision Support System for a user to resolve tricky situations for instance. The graphic on the right is an effective tool when it comes to deciding on the right balance between the two systems. In general the more strategic a decision and the less often it must be made, the more value a Decision Support System offers. 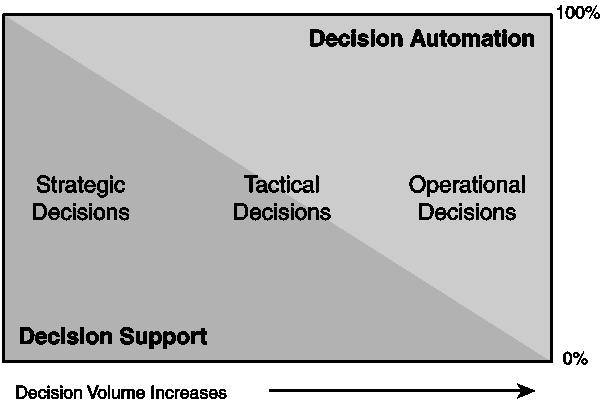 For more repeatable, operational decisions the value shifts significantly towards Decision Management Systems.